All About the ALSOPS: After only 1 year...but VA beach is calling! We knew our time in Charlottesville would be short but we never knew we would make such life long friendships in such a short period of time. Thank goodness we are only 3 hours away and many of them have already come to visit. We had so many great friends living in the same neighborhood making it convenient to just hangout and play all the time. Kylee was at the point that she didn't even knock when she went 2 doors down. These great ladies wondered what they could do to help and my response was, "Let's go shopping and out for ice cream!" I was in dire need of a girls night out. Yeah and Yeah they helped in many other ways too. Can I stuff you all in a box and take you with me. I am ready to move on to new places but not without ya. Thanks for teaching me sooooo much and being such wonderful examples. We managed to get the place packed while fitting in as many last minute playdates, swim lessons and get togethers as possible. Kylee pretty much lived at our neighbors house our last few days there and when told it was time to finally come home was found here under the bathroom sink hiding for a long time as we really couldn't find them. I still can't believe they fit under the bathroom sink and didn't eventually come out from pure pain or sweat. The things she will do to stay with friends! I can't blame her. Well, we pr omised the kids they could play in the moving truck and PLAY they did. Their creative minds came up with all sorts of ideas. We even had a picnic lunch inside the truck. They were at it from the morning Sky arrived with it till bedtime. At one point I wondered why all the girls were hiding from me and then saw the ramp to the truck covered in small l ittle seeds they had collected. When I asked, what they were doing there my innocent (yeah right) little Kylee said, "We are setting a trap, the ramp is supposed to be slippery so you or dad will fall and be a little hurt so we won't be able to leave." I never knew a sentence could be so horrible and sweet at the same time. 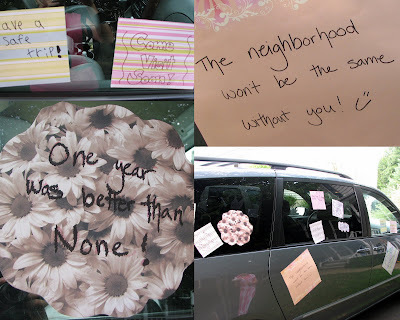 We woke up the next morning to a car that had been attacked with darling signs and sweet going away presents from our friends. With many tears passed we finally finished loading up and were on our way with promises made that they all had to come and visit. Skylar had the girls in the truck, Ted drove the Jeep and I was alone in the minivan allowing me to reflect and get ready for our next journey. We arrived to this and this helping my hurting heart but no things can replace true friendships. 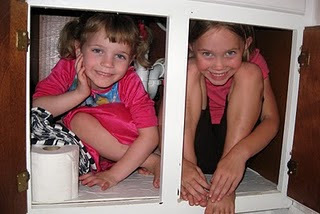 The girls had a blast exploring the house and we love its location. YES it has a guest room! For the next long while we will be renting since you all know how hard it is for me to make decisions and I have so much over the next couple of years to figure out...this area is huge. I do feel like we found a great neighborhood and good schools. Kylee made sure we made it up to the beach within our first 24 hrs. I mean really who needs to unpack. Priorities are Priorities. This is Sky and Ky pointing at our first of many dolphin sitings. Skylar has worked so hard and we are extremely thankful he has hit the end of his training. 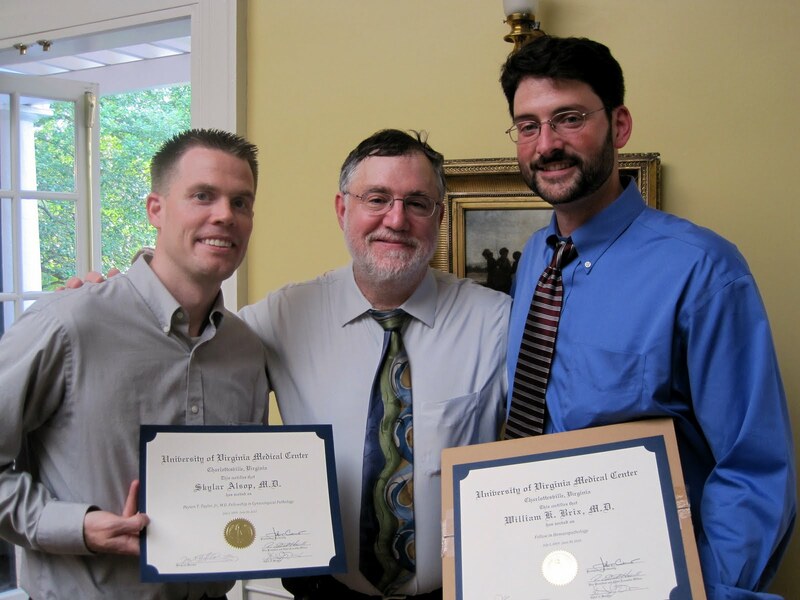 He was blessed with some amazing teachers at Penn State and UVA where he met wonderful doctors and has always been apart of a team with people he respects. We are thankful for his training but also the amazing connections it provided as we have now learned that even in medicine your world is more open based on who you know. WOW, Skylar has a JOB...a real one! Being in a new area not knowing anybody and it being in the middle of the summer with no scheduled events going on as Skylar headed off to his new job was a little overwhelming. However, me and the girls pulled out crafts and activities that I had stored up over the year that we hadn't had time to do while we counted down the days between each visitor. We also filled our time unpacking, shopping craigslist, over analyzing which TV sky should get, baking at our new kitchen island with the girls (a vision that has come true) and trying to keep cool. We quickly learned of open swim at the stake pres. pool where we began to meet some people in our w ard. Numerous baths have been taken in Mom and Dad's tub which has JETS providing endless bubbles...an absolute dream come true to these little girls! They also love the gigantic mirror around it which they dance and sing in front of all the time. We also had a great morning of finger painting with pudding which quickly turned into ice skating along the kitchen floor and finished with Mom caring them up to the shower. With the move I have sure enjoyed watching these two cling to each other. Pretty neat to know that where ever you go your family comes along with ya. There relationship has grown so much and they truly love being with each other. Alexis is normally more excited to show or tell Kylee something than me. HELLO and I MISS YOU!!!!! It was so great to catch up the other day on the phone, but it just wasn't enough!!! Chloe needs a playdate with Lexi and I need one with you! I hope you're doing well my friend. Love you much! wow! check out the house...looks and sounds so awesome! 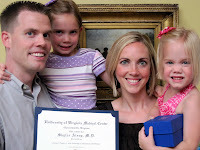 that is great and sad that you had such good friends in Charlottesville and i'm sure they are missing your cute family. I cant wait to come visit someday and will call and catch up soon! Your place looks awesome, the house is beautiful and the beach looks like so much fun! You are a nice mom to let your kids mess up your kitchen with pudding. Your friends in Charlottesville are so sweet! THat's sad you had to leave. Ahh, I have to admit, still hard days to relive for us around here! Lyd has been so bored the last few days trying to convince Kastyn to come dig in the backyard with her - she is working on some huge hole (probably a goblin trap) with Mt. Everest next to it. I know just the little girl who would have been out there digging with her...if only! On the flip side, I'm so glad that you guys are doing so well and thriving in VA beach and I hope that Skylar is still loving the TV he picked. We love and miss ya, come visit soon! Wow, I didn't ever hear about your neighbors leaving signs on your car - how awesome and cute. You really had/have quite the network of friends. Your house looks awesome and BIG. The story of Kylee and her friend and the seeds brakes my heart as I am sure it did yours. Excited to see you in a few days. Good job adjusting through all the challenges. Congratulations Skylar!